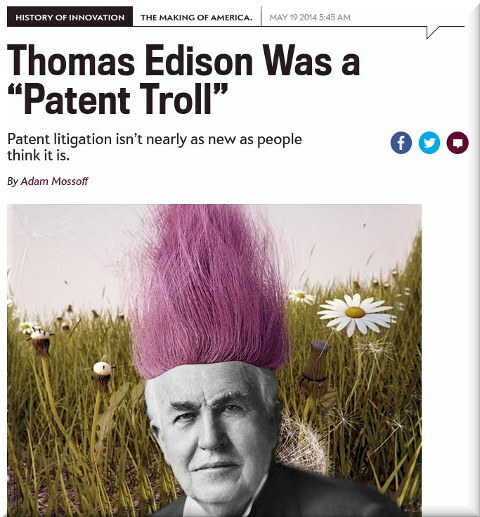 THE US patent system, still awash with patent trolls, increasingly repels these trolls. The USPTO and the courts have become a lot tougher on them. “The cuts are noticeable and some patent trolls close down ‘shop’ (they don’t actually have shops; they create and sell nothing).”Do not expect the patent microcosm to view that as a positive development as that makes the patent microcosm more and more obsolete. The cuts are noticeable and some patent trolls close down ‘shop’ (they don’t actually have shops; they create and sell nothing). “GE is part of this event, so it gets to post puff pieces in IAM while IAM defends Edison (GE).”He was not an inventor, he just ‘stole’ or took credit for other people’s work and then patented that work. “Samsung does not seem to be paying IAM. Why, after all, would a victim of so many lawsuits pay a proponent of such lawsuits?”GE is part of this event, so it gets to post puff pieces in IAM while IAM defends Edison (GE). Edison mythology is one of those mythologies that serve to prove money buys history (or victors write it). It was only hours ago that we wrote about IAM doing something similar with Finnegan and yesterday (less than 24 hours ago) we wrote about it doing the same with Battistelli. That’s just their business model.